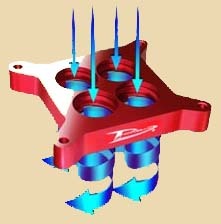 The "POWERAID SPACER" throttle body spacer gives an improvement in both power and economy. The kit supplied comes with the throttle spacer, spacers to lift the cable linkage bracket, gaskets and all required bolts and washers. In my install I also added washers to the bolts that are used in the linkage spacers. Tests on fuel economy have given an increase of 2-4 mpg but may differ depending on tyre size etc. Mid range power is increased on uphill climbs. Step 1 Remove the plastic airbox from above the throttle. 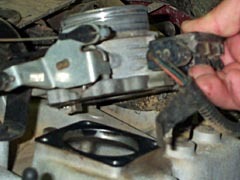 Once removed you will have access to the four bolts for the throttle body, remove them. Step2 There are 3 bolts that attach the cable linkage. 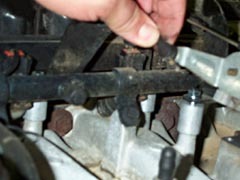 Remove these and lift the linkage so that you can put the spacers supplied. There are no washers supplied for these bolts but it is suggested to install some at this stage. 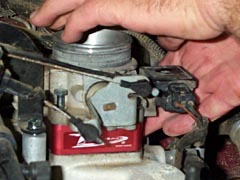 Step3 Lift the throttle body up. Be careful when removing the old gasket as it may break. Ensure all the pieces are collected. Once clean install new gasket, suggest the use of gasket goo at this stage but not necessary. 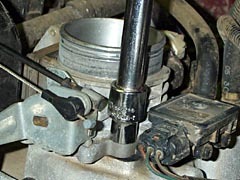 Lower the throttle body back down and using the new bolts and washers install the throttle spacer. Ensure that the spacer is installed the correct way as indicated. Step4 Finally you will need to adjust the throttle cable. Push down on the botton which is located on the side of the cable linkage. Push back the plastic tube to the right of it all the way in. Now push down on your accelerator pedal and you will hear a clicking noise, push the pedal all the way to the floor. The cable has now self adjuested. Tests for power increase show far more mid range abilities. A steep long hill where the XJ would normally stop accelerating at 80kmh now keeps pulling all the way to 100kmh. Tools: 10mm spanner and/or socket. Look on eBay. There are some on there for around $35US. As far as the spiral cut, it's pure snake oil, plain & simple. I have a straight bore spacer under my bored TB and it does better then any helix bore does. I wouldn't spend the $$ on Poweraid when there are others selling them much cheaper. Just my opinion. I am very skeptical of these devices. Do they do anything? Jeeps, I posed the same question to this group some weeks ago....after 2 weeks I did not get any response...........I would simply like to know how a throttle body spacer could decrease fuel consumption and/or increase power. I would like to see results off a dyno by a testing authority other then the manufacturer, I would like to hear an engineers explanation, anything...!! While I am not saying they dont work I do have a healthy atititude of sceptisism for these things and would perfer to spend money on proven products. Thanks OzJeeper....the power increase figures are impressive.....again, the question "what do they do?" is asked but remains unanswered, I would still like to know the science involved. "There is an often asked question about throttle body spacers for the Mopar 4lt motor and that is "what do they do?" After having the TJ tuned and run on the dyno, we can now answer that question"